Now the name might be a giveaway given that the center print looks like a diamond but it’s still an elegant name for a wallet right? Ladies, meet the Diamond CC Wallets from Chanel. 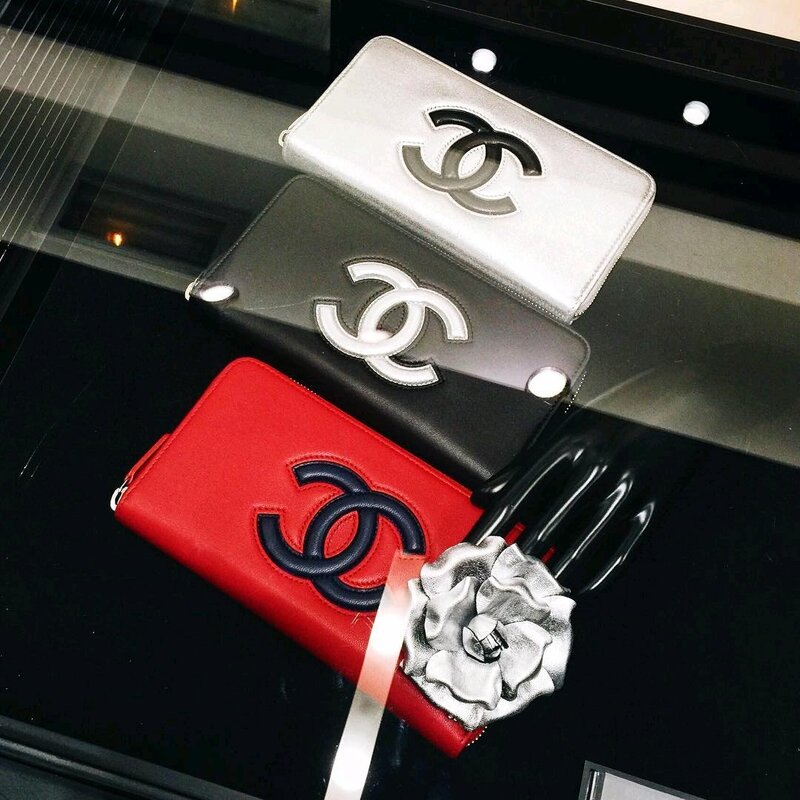 Made from grained calfskin & silver metal black, the Chanel Diamond CC Wallets are a fashion must haves! Stylish, chic and sophisticated, this particular Chanel wallet is something that you should carry on your bag wherever you go. Perfect for stashing your crisp bills and your credit cards thanks to its several card slots, the Diamond CC Wallet is one thing you’ll be reaching for every now and then as you pay for your lunch, shopping spree and even your grocery. Thanks to its elegantly stylish design, you’ll surely be proud to be seen owning it. Running your fingers through its grained calfskin leather will also gives you that luxurious feel to the touch! What’s the hottest Chanel WOC right now (yes Chanel Wallet On Chain Bag). No, it’s not the Classic Quilted WOC or the Timeless CC WOC. It’s actual is the Chanel Trendy CC WOC and the conversations is dominating in everywhere on the internet. The Chanel Trendy CC WOC is quilted, crafted with an interwoven chain. The size is mini, but that’s enough to keep you up at night. The design is actually mirrored from the original Chanel Trendy CC Bag. But the golden CHANEL plate is beautiful enough for us to run to the store and grab one. While we do not know the style code, the prices are $2400 USD or $3590 SGD. The size is roughly the same as the Classic Quilted WOC. They said love is sweeter the second time around and we couldn’t agree more as Chanel’s Diamond CC WOC made its way back to Chanel boutiques on its repeat. Yes, this bag has been previously released and if you remember, it belongs to Chanel’s Fall/Winter 2014 Pre-Collection. Now that we admitted that we’re in love with this bag, allow us to count the reasons why. First things first, we are over the moon for its bright yellow color. Yes, any bag that has a bright, bold and colorful hue makes its way to our favorites. The diamond quilt also made our hearts skip a beat. Yes, it’s that gorgeous. The pattern is just so luxuriously made. However, it’s the embossed CC in the center that makes it all the more eye-catching and beautiful. Want to own a signature urban wallet that screams street smart? Well well, look no further as we are going to introduce these Chanel beauties. These Bicolor Timeless CC Zipped Wallets are just exactly what you are looking for. Bold, bright and equally fashionable, you can choose among the three available colors of Chanel’s Bicolor CC Zipped Wallets. The creamy white colored wallet paired off with the black CC logo is sophisticated, perfect for women who knows class and elegance. The black colored wallet on the other hand is an absolute perfection with a white CC logo in the middle that looks ridiculously posh and luxurious. For those who are looking for a different kind of Chanel wallet, then go for the one that sports scarlet red. It is the the one that stood out from the rest since it is so eye-catching that it will be a shame to miss it. This type of color reminds us of a devilish woman who gets what she wants in life, including a Chanel bicolor wallet. Estimated price: €650 – 700 euro via Chanel boutique.